The XYZprinting UV Curing Chamber is compact, simplified, and elegantly designed in order to be placed in labs, offices, and other professional spaces. It's a space-saver, but the max curing size reaches Ø180 x H200 mm. 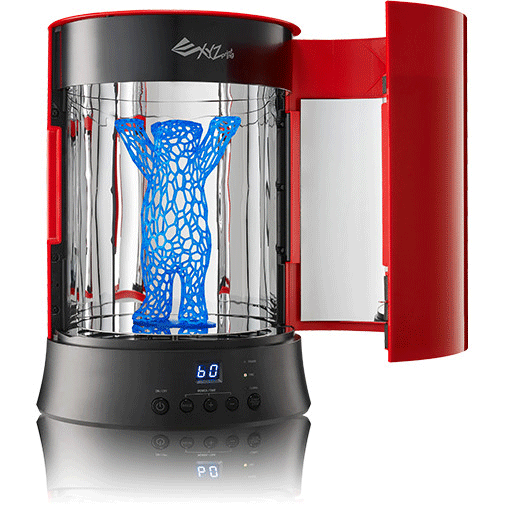 The XYZprinting UV Curing Chamber features a 360° turntable and a reflective inner mirror. The UV device outputs steady, focused and consistent UV lights to quickly cure prints made with photopolymer resins.The curing process increases the hardness and durability of the printed products. Unlike some of the other UV chambers that use mercury lamps, XYZprinting's UV Curing Chamber uses UV LED diodes. The light source produces no ozone, which is much more environment-friendly and energy-saving. The lamp life can last up to 10000 hours, ensuring you can cure your prints for a long time. XYZprinting UV Curing Chamber ir CE certified worldwide. Its UV LED wavelength ranges 375-405nm, so not only compatible with XYZprinting's general, flexible, and castable resin, it is also compatible with most of the SLA printers in the market. The UV Curing Chamber is the best choice for designers, Makers, and professionals.